This interesting surname is of early medieval English origin, and has two possible sources, the first being from the Norman personal name "Rol(l)ant", composed of the Germanic elements "hrod", renown, and "land", land, territory. The personal name was popular throughout Europe in the Middle Ages as a result of the fame of one of Charlemagne's warriors, who bore this name. The second source is locational from places so called in Derbyshire and Sussex; the name is derived from the Old Norse "ra", roebuck, and "lundr", wood, grove; thus, "wood of the roebuck". Locational surnames were developed when former inhabitants of a place moved to another area, usually to seek work, and were best identified by the name of their birthplace. 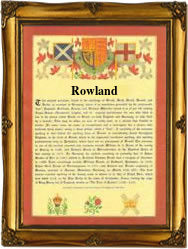 The modern surname can be found as Rowland, Rol(l)and, Rolance, Rowlands and Rollons. Recordings from Derbyshire Church Registers include: the marriage of Humfridus Rowland and Johana Hadfield, on August 25th 1604, at Baslow, and the marriage of Anthony Rowland and Ann Pirson on January 7th 1715, at Eyam. Coats of Arms were granted to Rowland families at Carew, in the Isle of Anglesea; in Shropshire; at Saxonbury Lodge, Frant in Sussex; and at Egham and Barnes in Surrey, which depicts a silver pile wavy on a black shield. The first recorded spelling of the family name is shown to be that of Simon Rolland, which was dated 1218, witness in the "Assize Court Rolls of Lincolnshire", during the reign of King Henry 111, known as "The Frenchman", 1216 - 1272. Surnames became necessary when governments introduced personal taxation. In England this was known as Poll Tax. Throughout the centuries, surnames in every country have continued to "develop" often leading to astonishing variants of the original spelling.